Start to look and feel good about yourself. This traditional herbal formula consisting of herbs from the Caribbean, South America, and Africa where they are used to rid the body of inflammations, excess fat and water, curb the appetite, and to supply energy. 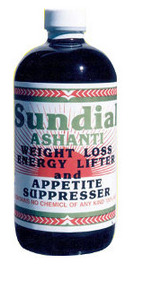 So remember, to lose excess weight, curb the appetite, and increase the energy level the safe way, natural and easy way, Check out SUNDIAL ASHANTI WEIGHT LOSS/ APPETITE CURBER and ENERGY LIFTER today, and watch those extra pounds disappear. Celebrate your culture and heritage with traditional products compatible with your biological makeup. Bitter Bark, Chaney Root, white Jointa, Sweet Basil, Pimento, Cayenne, cloves & Cinnamon.